Running a 5K used to be a pretty straightforward morning event, geared toward serious runners but that mentality is starting to change. 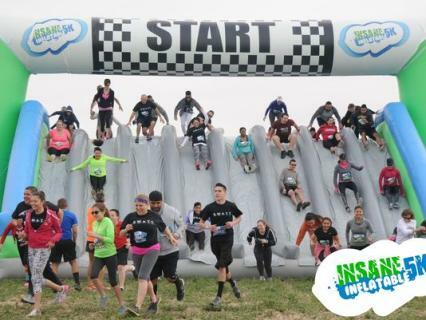 Themed races and events like The GloRun and Insane Inflatables are attracting participants to their events by changing the face of the 5K to focus on themes, obstacles, costumes, and of course fun for all ages and abilities. These events are the perfect opportunity to plan a trip, try something new, support a cause you care about all while getting outdoors and enjoying being active with friends, family, and neighbors. Here are 5 Dayton races to check out this summer and fall. The theme this year is 80’s and the course features 6 different themed glowing sections including stops like Moonwalk GLOzone, Arcade GLOzone, and ending the night with an 80’s dance party finish festival. You can get glowing for a good cause this year because The GloRun has partnered with Miami Valley Down Syndrome Association. The $29.99 registration includes a neon 5K t-shirt, glow sticks, and after party but participants making an additional donation to MVDSA will receive extra glow swag. The party kicks off with registration at 8pm followed by a costume contest for 80’s or Neon themed outfits at 9:15pm, and the bubble guns to start the race kick off at 9:40pm. The DJ will be spinning 80’s tunes well into the night, so grab a red bull because this is going to be a late one. This midweek evening race takes place at Carriage Hill MetroPark. Registration begins at 6pm and the heats start at 7pm on Wednesday July 6th. This trail series course is fairly flat but does not have water stations so runners are highly encouraged to bring their own water on the trail to beat the July heat. This event is being put on by the Ohio River Road Runners Club. Though the club is membership based, this event is open to the public. There is no entry fee for club members to participate. Non member entry fees range from $0 - $9 based on age. Awards will be given for first man and women overall in 4 age group categories and age group category award for 10 age categories. If you are not currently a member, you can join prior to the race and participate in similar events and trail series all year long. Ohio River Road Runners Club is a 501(c)3 non profit organization focused on promoting running with Dayton and is one of the largest running clubs in the nation. The 5th Annual Subway Dragons 5K will be held at Fifth Third Park on Saturday July23rd and is one of Miami Valley&apos;s largest races. The course loops around the Miami River and heats start at 9:00 am. Registration for this event is $25 in advance or $30 on the day of the race. Runners 17 and under can compete for $15. Included in your entry fee is an official 5K T-shirt, 2 tickets to a Dragons game, 2 vouchers for free subs or salad from Subway and race bag of goodies including Dragons souvenirs. New to the race this year is a costume contest and participants are encouraged to dress as Dragons or in baseball themed costumes. Best dressed awards will be given. Family friendly activities are open to all race participants and spectators before and after the race including face painting, inflatables, carnival games and an appearance by Heater and Gem. Strollers are allowed, dogs are not. This race will take place rain or shine. If you are headed out to the United Irish of Dayton Festival this year, why not throw on a pair of tennis shoes and get some exercise before you fill up on food. This race offers a 5K or a 10K route. Registration is $20 with a t-shirt or $15 without. The race is open to all ages and provides refreshments and awards upon completion. This is an out and back course so the runs start and finish on the Great Miami River Recreation Trail in Downtown Dayton, which means you’ll be right where the action for the festival. The race gets kind of a late start (10am) which means awards will be held right around lunch time. Awards are given for the top 3 runners in each age group as well as overall male and female runners. Partnered with The American Cancer Society, Relay for Life and the Paint Your World Purple campaign, this event is bringing the fun for a good cause. However, it’s a little tricky because a donation to the Dayton Relay for Life event is not built into the price of your registration. If you want to support the local Dayton event or are running in honor or in memory of someone at the Dayton Relay for Life, add the amount you wish to donate to your checkout when you register for Insane Inflatables online. Racing gets started at Kettering Field at 8:00am. There are 13 Waves, starting every 15 minutes from 8:30 - 11;30. Prices range from $49 to $100 depending on when you register. All access passes include $20 in merchandise credit and open entry to any wave you choose. The race will bring about 10 inflatable obstacles like The Wrecking Balls and The Waverunner. See a full list of Dayton obstacles here. The race is not timed and it is not necessary for participants to run between obstacles although they may choose to do so.